Quaama author Isobel Blackthorn will talk about her first novel, Asylum, in the Bega Library next week. 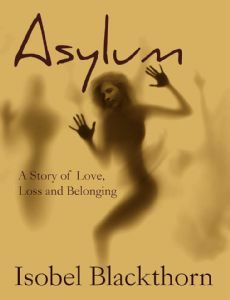 Broadcaster and book critic Ann Creber says “Asylum, which was released by Odyssey Books in May, is a rewarding read, rather like a meal when you savour every mouthful instead of gulping it down”. Seeking asylum from the wreckage of her life, Yvette Grimm arrives in Australia on a holiday visa. She applies for permanent residency with no hope of success. Resisting advice that she marry to stay in the country, Yvette invests her hopes in a palm-reader’s prophecy that she will meet the father of her children before she’s thirty. Set in the excoriating heat of an endless Perth summer, against the backdrop of asylum seekers locked in detention, Asylum is a gripping tale of loss and belonging that is dark, absurd and hilarious by turns. Photograph: Cover of Isobel Blackthorns book Asylum.